To reduce your cost, Brandsport offers this item in Bulk (sold here individually). Gorilla also lists this same item in a 4-piece set as Display Package # 41137ET. Keep rust and erosion at bay with a beautiful chrome finish that slows decay and keeps any car going longer. . 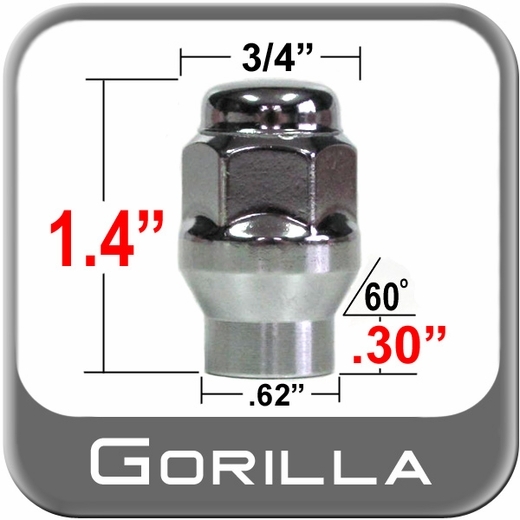 Nothing but the best tempered steel is used in casting these Gorilla chrome lug nuts. 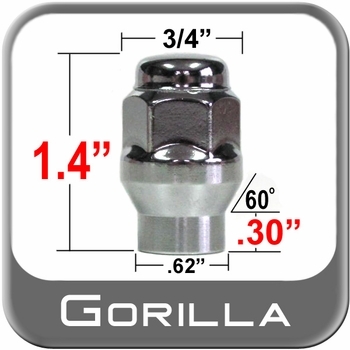 Accurate Gorilla engineering ensures precision fitting when it comes to any make and model . Product as specified good quality and workmanship. I wasn't able to get the locals to help, called and left message and within the hour had a call back and my questions answered and lug nuts ordered...Thanks Guys!!!!! When I replaced the 7" steel wheels on my Toyota T100 with 8" aluminum wheels, i needed to use 1/4" spacers to provide clearance for the front tie rod ends. Therefore I lost 1/4" of stud threads for the lug nuts. Rather than replace all of the studs, I installed these extended reach lug nuts instead. This option was much easier and less expensive than replacing all of the studs, and the lug nuts look much better than the stock ones. I am very pleased with the quality of the construction and the chrome finish. They fit perfectly, and the 3/4" across the lands allows any lug wrench or impact socket to fit in deep recessed lug nut holes of my wheels. The only reason I gave these four stars instead of five is because i would have preferred a little more length of the nut head, to aid in starting the nuts by hand. A longer head length was available in a larger head size, but I needed the 3/4" head size for lug wrench clearance in the wheel. Would have liked to have a little longer extension of the hex head to be able to more easily start the nuts by hand. The lug nut holes on my wheels are deep making it difficult to get the nuts started with just my fingers. This is not a big concern, since I can use a deep well socket to get them started by hand. Extended head length was available in a larger nut head size, but those would only allow me to use a thin wall socket to install. Perfect fit, exactly as described, fast shipping.